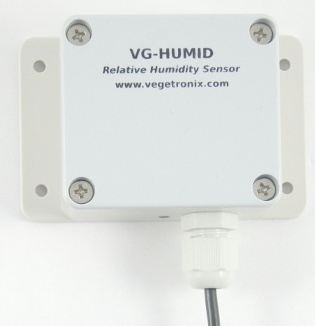 The VG-HUMID is a low-cost, low power, precision relative humidity (RH) sensor, for measuring relative humidity of air. The sensor and electronics are enclosed in a weather resistant flanged box for easy mounting. The electronic sensor is directly connected to the outside air through a small inlet tube, on the bottom side of the box near the cable gland. Because the small inlet tube isolates the sensor from the rest of the air volume in the box, latency to changes in relative air humidity is reduced. The sensor has a simple electrical interface of 3 wires: ground, power and an analog output voltage which is linear and directly proportional to the relative humidity ranging from 0 to 3.0V, where 0 represents 0% humidity and 3.V represents 100% humidity. It can be powered with a voltage supply from 3.5V to 20V, and consumes less than 11 mW (3.4mA at 3V). When ordering this relative humidity (RH) sensors, you can select the length of the power cable in standard 2 meter, 5 meter or 10 meter lengths. The sensing cable comes in the standard lengths of 1 meter and 3 meter lengths. See the ordering table below. Output Voltage is proportional to relative humidity. Wide supply voltage range (3.5 to 20VDC). controller board, weather resistant box, and power cable. 4.5% from 0 to 20 RH, and 80 to 100 RH. Output Range 0 to 3V linear with relative humidity. Pin 1 Red POWER: 3.5V to 20 VDC. Is the box water proof? 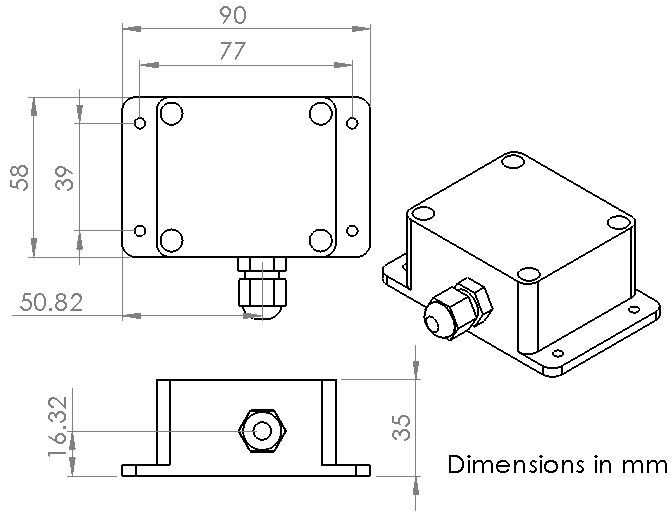 The enclosure is a water tight box with a gasket on the parting surface between the box and lid, however, to measure relative humidity, the sensor needs access to the air which it is measuring, so it has a small hole in the enclosure next to the cable gland to allow air to enter into the box. The box should be mounted with the cable gland facing downward so that rain or other water can not flow into the box. What to I get when I order a VG-HUMID relative humidity sensor? It includes: a sensor board, power cable, and weather resistant box. How should the enclosure be mounted? Mount the cable gland facing downward. The best way to get started is to purchase a few low cost relative humidity sensors from our webstore and try them out in your application.